Brasil Patriotas TV/Noticieros TelevisaJosé González Valencia, accused of being a member of Mexico’s Jalisco New Generation cartel, in custody in Brazil. The CJNG is one of Mexico’s most powerful criminal organisations. Brazilian police have arrested an alleged Mexican drug boss, federal prosecutors said on Wednesday, in a blow to one of the most powerful organisations in Mexico’s criminal underworld. Once a little-known gang, the CJNG has grown in recent years to challenge the Sinaloa Cartel of captured kingpin Joaquin “El Chapo” Guzman for primacy of the drug trade in Mexico. Screen grabMexican drug cartel Jalisco New Generation. Gonzalez Valencia had been living in neighbouring Bolivia for two years after fleeing Mexico and had entered Brazil as a tourist using a Bolivian passport, Brazilian prosecutors said in a statement. Gonzalez Valencia was arrested at a beach resort near the coastal city of Fortaleza and brought to the headquarters of the federal police for the state of Ceará. He had been in Brazil on vacation with his family since December 22, a Brazilian police official said, and did not resist arrest. An official at the state prosecutor’s office in the western Mexican state of Jalisco – where the CJNG established itself and serves as a base for much of its operations – said Gonzalez Valencia is the brother of Abigael Gonzalez Valencia, a CJNG leader captured in February 2015. Abigael Gonzalez Valencia was named by the US as a narcotics trafficker and leader of the Los Cuinis drug-trafficking organisation, alongside alleged CJNG chief Nemesio “El Mencho” Oseguera Cervantes, in April 2015. US Treasury/Office of Foreign Asset ControlThe Jalisco New Generation and Los Cuinis drug-trafficking organisations’ leaders and areas of operations, according to the US Treasury Department in April 2015. Los Cuinis and the CJNG are tightly allied; some believe Los Cuinis is the financial arm of the CJNG, while others see them as partners. Some reports prior to Abigael Gonzalez Valencia’s arrest identified him as the overall leader of the two groups. 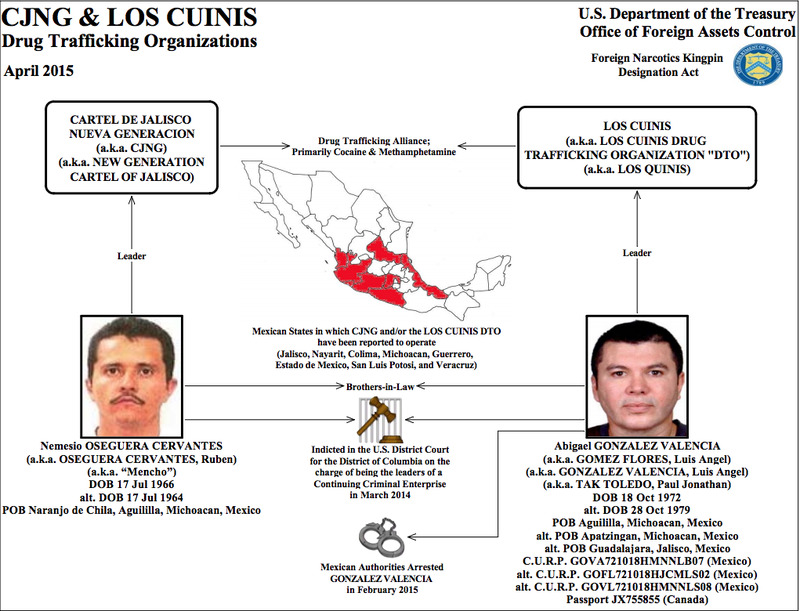 The CJNG itself originally formed as a faction of the powerful Sinaloa cartel, but it broke away around 2010, assuming control of drug trafficking in Jalisco state. In the years since, CJNG’s expansion, first eastward and then northward, has helped push deadly violence to new highs in Mexico. Along the way, the CJNG has corrupted and bloodied police and military personnel, expanded into the US market, and, according to some, become the US’s main supplier of crystal meth. The CJNG is now considered one of the most powerful criminal groups in Mexico – many see it and the Sinaloa cartel as the only true cartels left, after years of law-enforcement pressure and inter- and intra-cartel fighting caused rival groups to splinter in smaller factions. Competition between the CJNG and the Sinaloa cartel seemed to accelerate in the months after “El Chapo” Guzman’s arrest in January 2016, driving violence in and around Sinaloa state – including the August 2016 kidnapping of at least of one of Guzman’s sons, who was returned unharmed. Fighting between the CJNG and Sinaloa cartels appears to have eased in recent months, but factions of each organisation are believed to be competing for control of Tijuana and Ciudad Juarez, both of which are valuable territories for smugglers seeking entry to the voracious US drug market.